Light: Prefers a warm sunny spot. Moisture: Needing adequate water/rainfall and some humidity. Propagation: By seed, air-layering, grafting or budding. 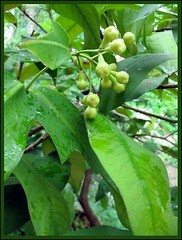 Features: Syzygium javanicum is a semi-deciduous tree, 5-15m tall and 3-10m wide with yellowish-green to dark bluish-green leaves. Clusters of lemon-green buds appearing at the branch tips or in the axils of fallen leaves or any point on its trunk/branches will bloom in 1-1.5 months time. The slightly fragrant white to pale yellow flowers (2-3 inches wide) with four petals and countless stamens (1-1.5 inches long) are a rich source of nectar for honey bees. These showy flowers borne in drooping panicles of 3 to 20 will fall and litter the ground in 2-3 days, leaving behind the tiny fruits to mature and ripen in about 2 months. 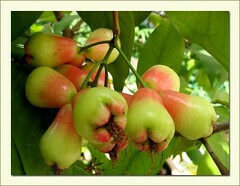 A healthy tree can produce abundant fruits and has two fruiting seasons annually, May-September and November to March. 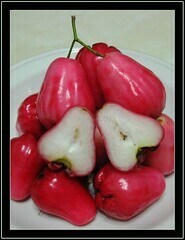 Usage: Also known as Java Rose Apple, it is grown specially for their edible fruits that can be very refreshing and quenching on a hot day. They’re pear-shaped, 1.5-2 inches long and slightly narrower in wide, skin is smooth, waxy and thin that comes in varying colors ranging from white, pale green, green, pink, rose red and crimson. The fruit’s pith is snow white like cotton. Often seedless, you can eat these fruits out-of-hand, needing no peeler! The texture is crisp, almost crunchy and juicy with a mild scented flavour and tasting mildly sweet to sweeter (the reddest fruits are the sweetest). Fruits can also be added in salad and the unripe fruits eaten with salt or dipped in a sweetish-spicy sauce. 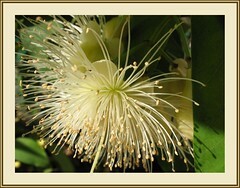 Care: Generally, requires very little attention and no pruning is needed unless to promote bushiness. For subtropical regions: Browse through here and here to acquaint yourself with more plant facts. 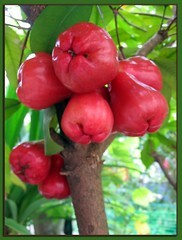 Updated on July 20, 2007 – Slightly more than a dozen fruits of the Java Rose Apple were harvested this morning and consumed after dinner! Hmm…so sweet and quenching! Though an equal number of fruits fell to the ground probably due to strong wind and heavy rain last night, we’re happy to at least have some this time round! Pritchardia pacifica (Fiji Fan Palm): big, bold and beautiful! If you get bored with eating them, try stewing them with lemon or lime juice and then putting a crumble topping on them!